It has become a annual tradition for me to release a new version of the “WPF Christmaslights” every year. I try to add something fresh to the application every time. The reason for doing so is because it’s fun to do and it allows me to experiment with different technologies. I’ve actually spent very little time on this application, but it’s fun to see it running on the desktops of my co-workers. At Christmas, many people like to decorate not only their houses and offices, but also their computer desktops. If you are one of those people, then this little and free program will come in handy for you. It consists in a virtual garland of light bulbs that light on an off and change their color according to a set pattern, just as those lights you use to decorate your Christmas tree or the front of your house. The garland surrounds your desktop and it remains always on top, so you can watch the lights even if you have another program's window open. The program can be customized in several ways. For example, you can adjust the space between the bulbs as well as their blinking speed. You can program the lights to blink automatically, or as you type, or following the rhythm of the music that is playing in your media player. The program also offers different types of blinking, such as standard blinking, interlaced, flashing, and some more. Also, you can adjust the intensity of the lights colors. In sum, if you enjoy Christmas and want to add a beautiful ornament to your desktop for the upcoming holidays, then you may want to try this one. And guess what, it got a 5 star review! Software.informer.com would like to inform you that your product ChristmasLights 1.0 has been reviewed by our editors and your program got "5* Editor's Pick Award" http://christmaslights.software.informer.com/. If you want to see how the application works, if you want to contribute or if you want to report bugs you should visit the project page on Codeplex. So tell me, what new features do you want to see in this years update? The zip file is about 30 mb, seems like a lot of bytes for just a sound driver… but hey, it works. Just download and extract the zip file to a folder, then point the device manager to that folder and let it install the driver. If you want to play sounds using the WPF MediaPlayer class then you also need to have Media Player (at least version 10) installed. To do that on Windows Server you need to install the “Desktop Experience” feature. This how-to is written by Mark Groot, and published on here on Brokenwire.net with his permission. Normally when you try to unit test a method from an internal class, u will receive a message saying something like ‘… is inaccessible due to its protectionlevel’. The typical response in these kind of situations is either ‘ah, f.. it. I’ll just skip this test’ or ‘I’ll just make the class public. Who cares.’. What you actually want to do is to make the internal method accessible to your unit test project. As it turns out, that this isn’t really all that difficult. Visual Studio will do most work for you. There are however a few things u have to keep in mind. In this article I will stretch out on those things. First, let’s make a little console app which contains an internal class. (The entire solution can be downloaded here). When you run this code you will get a nice little console window telling u whether or not you won. Now how to test this? There are a few steps you have to take. Let Visual Studio create a unittest and a unit test project for you. You can create a unit test for the YouWon method by right-clicking the method and selecting ‘Create Unit Tests…’ from the contextmenu. Clicking the menu option will popup the following window. In the treeview you can select additional methods for which you want to create unit tests. You have to select a project from the listview in which the test has to be created. Now Visual Studio will create a test class for the selected method in your selected unit test project including all the necessary references. Visual Studio will also add the assembly:InternalsVisibleTo attribute to the AssemblyInfo file of your console application. 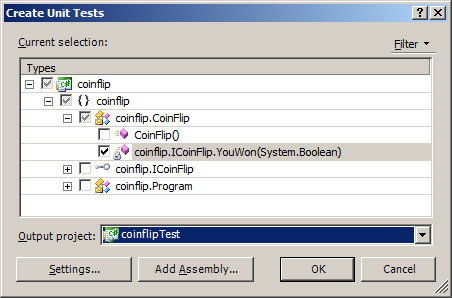 By using this attribute the unit test assembly will become a “friend assembly ” of the main assembly, and therefore the main assembly will allow the test assembly access to its internals. We enter the value false into the method and we expect to receive a value false back. If that is true, then the test passed. There was a time where finding the public key token using sn –T was enough. Now however, the InternalsVisibleTo attribute uses the public key. We can retrieve that key in two steps by using the sn.exe tool. Then add the key into the AssemblyInfo of the console application. To see if this works: build the project, and run the test. Watch, learn, don’t repeat. Share the pain in the comments. Recently I got several questions about this topic, so I thought it would be nice to write a little bit about how to use XML inside SQL Server. First of all: *don’t* query XML using substring(), pos() and other string manipulations. If you still do ugly stuff like that then you have to read this article and you also have to buy a big pie for your co-workers. So we had this project where we had several nvarchar(max) fields which actually contained xml documents. This way of storing XML is fine when you don’t need to look inside the xml data itself. But when you want to use the data inside the xml documents its convenient to use the xml datatype. This datatype is available from Sql Server 2005 and up. In this post i’ll try to introduce you to the magical world of XML inside sql server. All examples below are in this downloadable xmldemo.sql file, so you can easily try them yourself. The Xml datatype allows you to perform several operations on the xml data from within t-sql. Although this is not very fast, it’s often better than round-tripping and doing the xml parsing in your application layers. You can use the xml datatype just like any other datatype. You can use it for tables, table variables and also for regular variables and procedure/function parameters. In this brief introduction I’ll highlight the usage of the Value and Query methods. All methods are well documented in the MSDN library. This would return only the <header> element, with its contents. The language used to write the query is called “XQuery”, which is an XPath based query language defined by W3C. But be warned, only a subset of the official language is supported. This would return only the first of the two <item> elements, as an XML fragment in an XML field. If you are puzzeled by the syntax here, then please take a moment to look at these examples, that’ll give you a quick start. The value method is one of the methods that I personally have used the most. With this method you can select contents from an XML field and convert it to a “regular” sql datatype (also known as scalar values). Will return: “a is for apple”, because we asked for value of the the first  node that matched the “/document/items/item” expression. This statement would return all records which have an xml document in their “field1” column where the value first “item” tag starts with “a”. Please remember: this is nice but it will kill performance if you attempt this on a large table with loads of xml documents in it: in sql 2005 you cannot put indexes on values inside XML field! Sql server 2008 (and up) will let you create XML indexes as well. One of the things I get asked most is how to query xml documents which have one or more xml namespaces associated. Please notice that the only difference is the addition of a namespace. Running the first .value method example query on this record will return a NULL value. This is because the xml elements now live inside the “http://www.brokenwire.net/xmldemo” namespace, and the “/document/items/item” xpath expression looks for these elements without a namespace, so it doesn’t find anything in this document. To be able to query with namespaces there are (at least) 2 possibilities. You can either completely ignore the namespaces and go directly to the elements you need, or you can declare the namespace and use it properly in your expressions. This expression will work for both the document WITH a namespace and the document WITHOUT a namespace. This expression will only work for the document WITH the namespace, because in the other document the elements live in the default namespace. If you can’t get enough of this then this introduction to XQuery article on MSDN is worth reading too. You’ll need a lot more Xpath and Xquery knowledge than covered here to make really good use of the potential powers that are enabled by the xml datatype. Fortunately these are both standardized by W3C, so learning them will enable you to do much more cool stuff. And don’t forget, you can post your ideas, notes, thoughts and “please send me the codez” requests in the comments, that’s what they are for. File with demo code for download here. 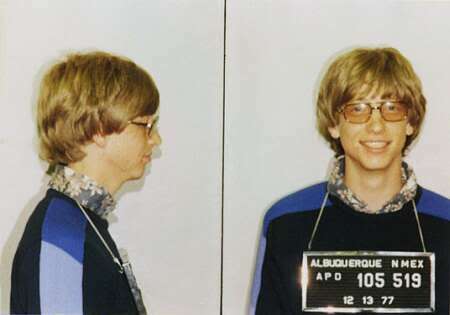 This mugshot is said to be made when Bill was caught speeding, back in the seventies. Well how about that! These folks at Microsoft sure have a good sense of humor. Next question: who is the shadow person used in Google contacts & Gmail?